The Sewing Cave: Radio Interview! Well can you say OOOO MMMM GGG? 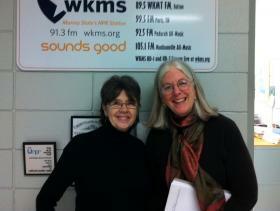 I was contacted by Kate L. of WKMS Radio. This is the public broadcasting station for Murray State University. She saw my interview for WK&T magazine and was wondering if I would accept an invitation to be interviewed on the radio. OMG!! 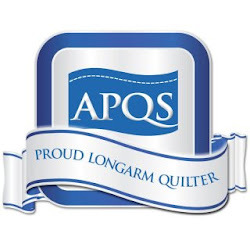 So I agreed and yesterday spent a most enjoyable 9 minutes describing how the Internet helps quilters. If you would like to listen here is the link. I have a top to work on as soon as an order from Superior Threads arrives. I also ordered some light blue to do my blue/white stars with. LOTS of wide open white blocks. After I pieced it that way I hated it. So it will be a change to learn how to fill in the wide open spaces! Here is a top that I picked up last week from Phyllis. This is Ruth Ann T's and I think it is amazing! Ruth Ann suggested a bright variegated thread - and I SO agree. We will be doing 2 different leaves in the black sashing, feathers in the colored pieced blocks and something simple in the printed fab. section. I'm leaning toward some diagonal cross hatching. I think it would be simple - but it wouldn't bring in another quilting pattern. Today the mailman dropped off a box from Rita. Long ago I did some for her and Now she is back! I'm so happy the quilting bug bit her again. Looking forward to working with Rita again. see the tiny "piped" binding? What a great interview and how fun for you! Love all your projects. You are really getting a lot finished, as usual! I enjoyed your interview. You did a great job. of our local phone/internet provider magazine. On how I use the internet in quilting! Squiggy is an APQS fan!